Maybe your parents couldn’t afford braces back when you were a teen or your teeth didn’t bother you enough to warrant either the pain or the expense. Maybe you just didn’t want to be called “Metal Mouth” for two or more years, because you were basically a shy kid. Maybe you wish you could turn back the clock and re-think all of this because today – you’re not happy with your crooked teeth smile. Problem is… you don’t want to look like a 12-year-old wearing braces. Well… welcome to modern dentistry where you can finally be a grown up and wear braces that no one else can see! Yes, that’s right – invisible braces that correct crooked teeth and close up the gaps you’ve been staring at for years. 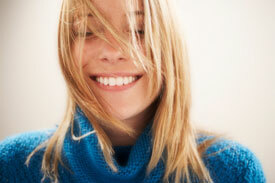 Want to know more about invisible braces? We’d be pleased to set up a consultation and evaluation to discuss with you in detail all the wonders of brace-less braces! Call our office and we’ll schedule a visit for you right away. Invisible Braces – How Can They Work? Invisible braces, which really aren’t braces at all, are used to correct moderate tooth crowding in adults. Much like a series of aligners (retainers) that fit snugly to the teeth, invisible braces are modified slightly every few two weeks until the desired results are achieved. Each aligner in the series is worn 24/7, for approximately two weeks, except when you eat and drink or brush and floss your teeth. As you progress through the series of aligners, your teeth move bit by bit, week after week. Generally, you complete the series of 18-30 aligners and gain the desired results within 9-15 months. The smile you’ve always wanted is waiting for you and you can get it at Cutbirth & Sanderson General Dentistry! Enjoy the comfort, convenience, look and feel of today’s invisible braces and achieve the results you’ve always dreamed of in fewer visits and a lot less time!